As a group, these closely related species are commonly known in Europe and Africa as padlopers (originally meaning "path-walkers" in Afrikaans), due to their habit of making tiny pathways through vegetation. 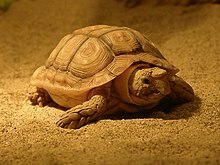 In other parts of the world, such as the United States, they are known as Cape tortoises. The genus is indigenous and endemic to South Africa. H. areolatus (common padloper or parrot-beaked tortoise), of the southern Cape coastal region, the most common padloper species. H. femoralis (greater padloper or Karoo cape tortoise [sic]), of the highveld grasslands, the largest of the padlopers. They are threatened by habitat destruction, traffic on roads, overgrazing, and poaching for the pet trade. Another threat comes from introduced species, such as domestic dogs and pigs. Among the Homopus species, H. areolatus adapts well to captivity, as their diets are not highly specialized. The others do not generally survive well in captivity unless some effort is made to supply them with their natural food, that is, endemic plants from the Cape/Karoo regions. Many are taken from their natural habitat each year, and subsequently die as a result, as they do not readily adapt to typical captive diets and environment change. However, they can be very hardy in captivity, and most problems with captive care are caused by faulty nutrition, high humidity, or bad husbandry. Wikimedia Commons has media related to Homopus. ^ a b ITIS (Integrated Taxonomic Information System). www.itis.gov. ^ "Homopus Research Foundation, reports". Home.caiway.nl. Retrieved 2017-07-17. ^ a b c d e Corton, M., Homopus (Padloper Tortoise) Care, World Chelonian Trust (retrieved August 20, 2013). ^ a b Obst, J.; Richter, K.; Jacob, U. (1988). The Completely Illustrated Atlas of Reptiles and Amphibians for the Terrarium. T.F.H. press. ^ "Scarce Home". Academic.sun.ac.za. Retrieved 2017-07-17. ^ a b "Homopus Research Foundation". Home.caiway.nl. Retrieved 2017-07-17.